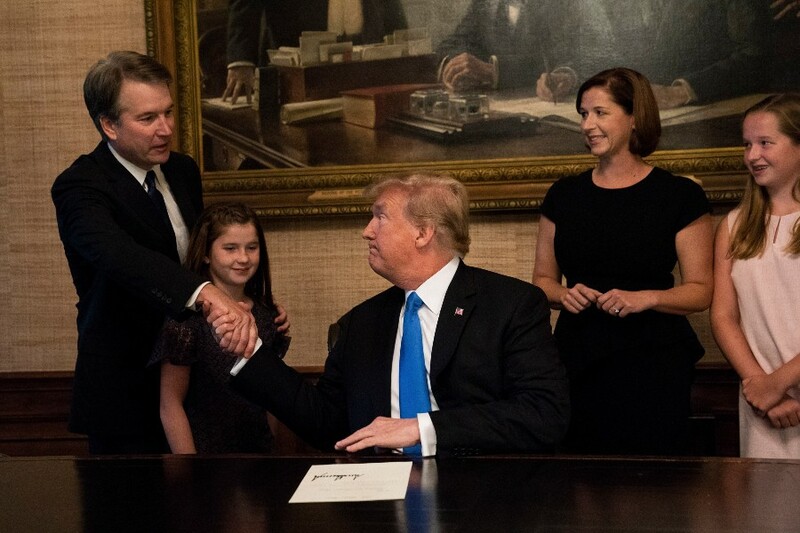 WASHINGTON — President Donald Trump on Monday nominated Judge Brett M. Kavanaugh, a politically connected member of Washington’s conservative legal establishment, to fill Justice Anthony Kennedy’s seat on the Supreme Court, setting up an epic confirmation battle and potentially cementing the court’s rightward tilt for a generation. The nomination of Kavanaugh, 53, a federal appeals court judge, former aide to President George W. Bush and onetime investigator of President Bill Clinton, was not a huge surprise, given his conservative record, elite credentials and deep ties among the Republican legal groups that have advanced conservatives for the federal bench. But it will galvanize Democrats and Republicans in the months before the midterm elections. Kennedy, who is retiring, held the swing vote in many closely divided cases on issues such as abortion, affirmative action, gay rights and the death penalty. Replacing him with a committed conservative, who could potentially serve for decades, will fundamentally alter the balance of the court and put dozens of precedents at risk. Kavanaugh’s long history of legal opinions, as well as his role in some of the fiercest partisan battles of the past two decades, will give Democrats plenty of ammunition for tough questions. Nearly 20 years ago, working for the independent counsel Ken Starr, he laid out broad grounds to impeach Clinton — words that Democrats can now seize on. Sen. Mitch McConnell, R-Ky., who leads the barest of Republican majorities, had also expressed misgivings about his path to confirmation. For Democrats, the nomination sets up a political battle they are almost certain to lose. While Republicans hold a razor-thin margin in the Senate — Sen. John McCain’s absence because of his brain cancer reduces it to 50 seats — a handful of Democrats might vote for the nominee, particularly those running for re-election in states where Trump won in 2016 and is still popular. However slim his odds of success, Sen. Chuck Schumer, D-N.Y., the Senate minority leader, framed the confirmation battle as a referendum on the issues most important to Democratic voters. Republicans hope the appointment will mobilize their voters as well.